Brendan Maher put in a good shift for Borris-Ileigh yesterday. 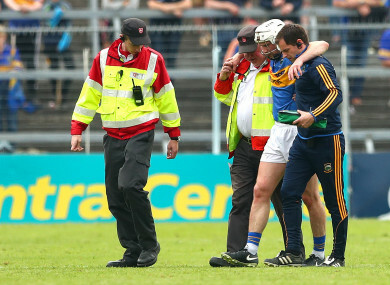 Brendan Maher was struck down in last year’s Munster championship. 2016 ALL-IRELAND WINNING captain Brendan Maher has made a successful return to club action after a devastating cruciate injury. In another significant boost for Liam Sheedy’s Tipperary hurlers as the Munster championship draws nearer, Maher lined out for Borris-Ileigh in their championship win yesterday. He came through an inter-county cameo unscathed in the second half of last month’s league quarter-final defeat to Dublin in Thurles, but a real test followed yesterday with significantly more minutes under the belt as he showed superb form. 2017 finalists Borris-Ileigh beat reigning champions Clonoulty Rossmore on a scoreline of 1-18 to 1-15, and two-time All-Ireland winner Maher chipped in with six points. The 30-year-old opened the scoring with a first-minute free and went on to impress with four more, and another from play in a commanding performance. He suffered the dreaded cruciate injury in Tipp’s loss to Clare last summer but his return comes as a huge boost to the injury-plagued Premier side. “Brendan has shown his character by coming back from that injury,” as his proud team-mate and county captain Seamus Callanan said last week. “He was putting in huge effort and still leading by example in everything he has done. It’s great to have a bit of game time into Brendan in the last game of the league.